Beth Stone Studio: Diamond Candle Review and Giveaway! Diamond Candle Review and Giveaway! 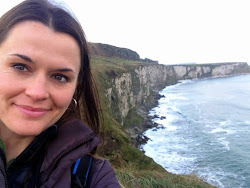 Recently, I was contacted by the nice folks at Diamond Candles, who asked me if I would be interested in doing a blog review in exchange for a free candle for myself and one to give away to one of you, my fabulous readers! I wasn't familiar with Diamond Candles, so I did a quick Google search and discovered that a Diamond Candle is an all natural, eco-friendly, 100% soy candle that contains a surprise ring worth anywhere from $10-$5,000 inside! Yep, it's true - buried treasure in each candle! It's like the lottery, except you will actually get something for your money every time. You can check it out for yourself on their website, blog, YouTube channel, Facebook, Twitter, Instagram, or Pinterest. People are finding some really gorgeous (and in some cases, really valuable) rings inside these candles, peeps! This was the point when I reached a bit of a dilemma. I was very curious; but, if you know me well, you'll know that I don't do candles or air fresheners - not because I don't want to, but because my nose is a serious over-reactor. No kidding, if you met my nose at a party, you'd give your friends a knowing, sidelong glance and mouth the words, "Drama Queen," when its back was turned. You: Huh? Why would your nose be at a party without the rest of you? Gross. Anyway, due to my intolerance of most candles, I wasn't quite sure if I should agree to the review or not. But did I mention that there would be a ring worth up to $5,000 inside??? Um, hello?!? I had a pirate-themed birthday party when I was 9. You had me at "buried treasure." So I agreed to the review and hoped I wouldn't be wearing a clothespin on my nose while I burnt my candle down in my treasure-hunting, ring-lottery mania. You: You'd better stay away from Vegas, weirdo. I deliberated long and hard over all of the fabulous-sounding scent options, but finally decided on "Apple Slice." My candle arrived very quickly, and I immediately lit it. I burnt the candle for several hours two days in a row and didn't have any type of adverse nasal reaction (a small wonder in my case). The candle was strong enough to fill my whole house with a delicious, fresh apple scent; but not so strong that it was overpowering. It was just right. So you might want to give these candles a try if you, like me, are sensitive to fragrances. These just might work for you! You: Okay, okay, quit talking about your nose and show us the ring already! You: So what's it worth? Well, I'm not sure. It DOES have a stamp inside (I've read that the $10 costume pieces don't.) I think it says, "China," and something else too small to make out. According to the website, the ones that say something like "China" or "Thailand" are worth around $100. The more expensive ones have "14K" stamped inside. So, it looks like I have one of the mid-range rings, which is pretty exciting! Next time I go to a jeweler, I might take it along and see if they can give me an estimate. The only con to my Diamond Candle experience was that the ring is a bit big for me, and there was no option to choose a ring size when I placed my order. The website says they include rings in the most common sizes, so if you have average-sized fingers, your ring will probably fit. However, if you're like me and have munchkin hands (my wedding set is size 4 1/4 to give you an idea), then it may run kind of big on you. Of course, if you get one of the more expensive rings, then it would be worth paying a few bucks to have a jeweler size it down for you. If you get a costume piece that's too big, you could always give it to a friend, or you can get creative with it - like the lady on Pinterest who turned several rings into a pretty statement bracelet. People are also getting creative with the glass jars after their Diamond Candles burn down. So, it's like three gifts in one! And now, for the exciting part: I've got a coupon code for a FREE DIAMOND CANDLE to give to one of you! To enter, simply choose from the options in the form below. Once the contest ends, I will contact the winner with your free candle coupon code! Good luck, and be sure to share this with all of your friends! P.S. 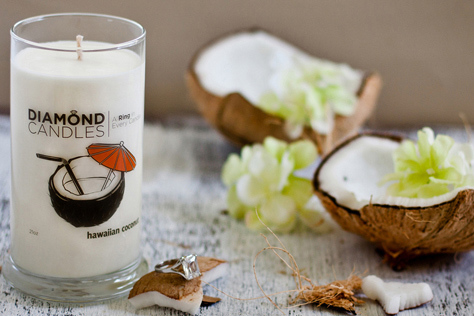 I've tried the "Hawaiian Coconut" candle now too, and it's fabulous - it's the closest thing to sitting on the beach sipping a fruity umbrella drink without, you know, actually sitting on the beach sipping a fruity umbrella drink. Bonus: it didn't freak my drama-queen nose out either! You can check it and all of the other great scent options out HERE. Jacquelyn, thank you for thinking of me. Although I've done a couple of candle reviews here, I've decided to head a different direction when it comes to product reviews. I'll probably stick with more art/craft related products in the future, since that's more relevant to my blog's topic. Thanks for stopping by!